Toni Carabas and his wife Lucia are a wonderful couple who now live in the village of Pestere where Toni grew up. Toni and Lucia care for Toni’s mom who lives with them. Lucia works in Austria for 6 months a year (one month in Austria and the next at home) to supplement the meager income from Toni’s churches, which is around $300/month (this includes money for fuel and car expenses). Toni currently serves two churches. One located in his hometown village of Pestere. This year, there was a baptism service in this church. Toni also travels a great distance to pastor a second church in Teregova where the church population is almost exclusively Gypsy. Toni has a heart for this ministry even though travel expenses are high and the salary level very low. Toni sees God’s hand in both locations would love to partner with individuals and churches who also know that God would not forget anyone in His plan no matter how remote the location. 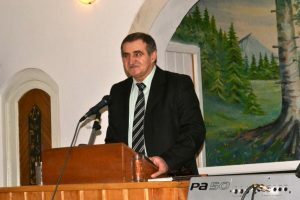 Individuals in Windsor, Maine and Windsor Memorial Baptist Church need help in assisting Toni accomplish God’s plan in some of the most remote regions of Romania.